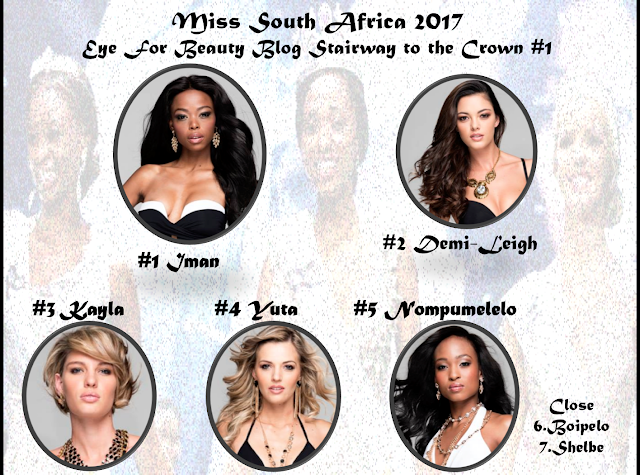 Here it is, our first Stairway to the Crown for Miss South Africa 2017. As I mentioned earlier this week, this time I have decided to give the voting power to 12 pageant experts from around the world. This is the first time in the history of my blog that I am not choosing who should go on the leaderboard - in fact, I will abstain from voting until the very end. Eye For Beauty Blog's first ever started in the most interesting way possible. Hot favorites Iman Mkwanazi and Demi-Leigh Nel-Peters tied for first place with 26 points each. In the end, it was down to who got the most votes as the winner of Miss SA 2017 by our panel of experts that determined who got the first place spot on our leaderboard. With only one more winner's vote than Demi-Leigh, Iman took it by the narrowest of margins. Albin (USA), Arturo (Canada), Gian (USA), Greg (Belgium), James (Hong Kong), Jean (Belgium), Julie (United Kingdom), JT (Philippines), Lex (Philippines), Sally-Ann (United Kingdom), Sifiso (South Africa) and Sujay (India). Special thanks to all our judges! Great job, everyone!